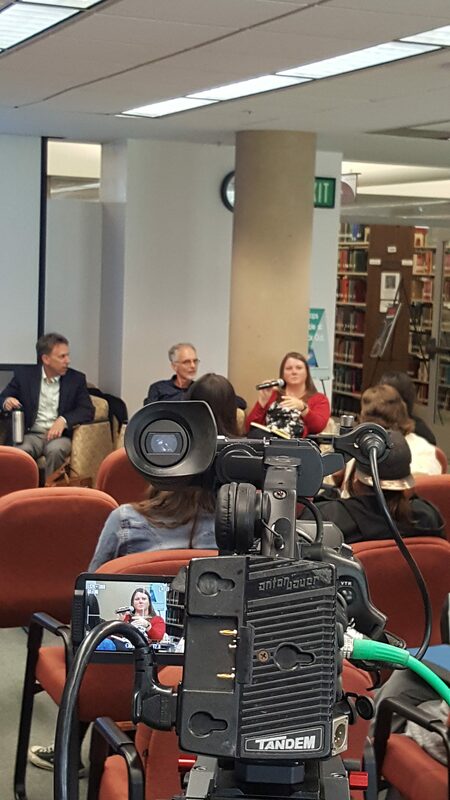 Students went “through the memory hole” in a discussion with faculty panelists Dr. Chris Naticchia, Dr. Charles R. Metts, and Dr. Cherstin Lyon, in part two of the three-part series of the classic novel “1984,” on April 26, following the previous week’s film screening. “The 1984 program provided an excellent opportunity to engage students, faculty, and staff in a textured discussion about increasing surveillance in society and the impact it has on our lives, behaviorally, psychologically, and beyond,” stated Robie Madrigal, Marketing, Development, and Outreach Specialist. The Yotie Talks, is a new speaker series that began in the 2015/2016 academic year by the University Diversity Committee, which is designed to discuss current issues that are critical to our college campus, according to the CSUSB webpage. 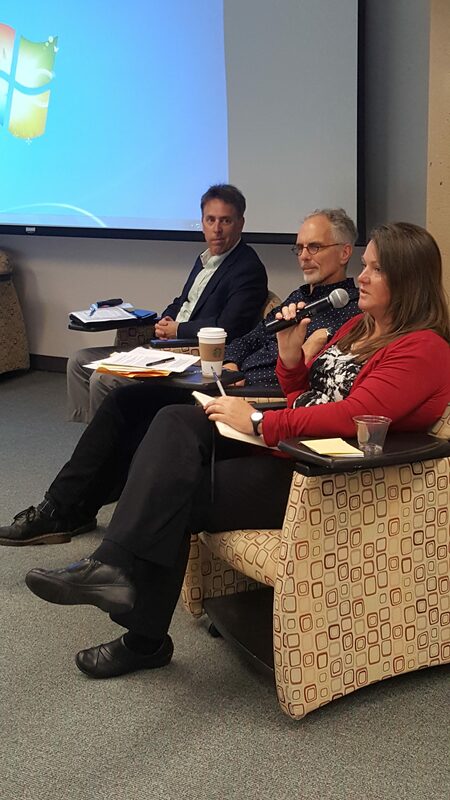 “We are going to Orwell to try and make sense of how we got to where we are right now,” stated Metts, in an interview after the panel discussion. Kelly Anne Conway’s use of the term alternative facts in an interview describing the tactics used by Press Secretary Sean Spicer and may have driven sales of the classic novel, according to an article in The Guardian. In “1984,” doublespeak is language that is purposefully constructed to disguise its actual meaning. 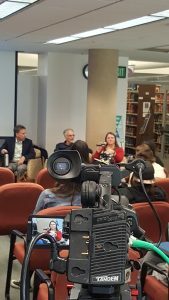 Topics discussed by the Yotie panel ranged from: what constitutes freedom, personal advertising, privacy, totalitarianism, autonomy, company overreach and political and social trends seen in the book and now. 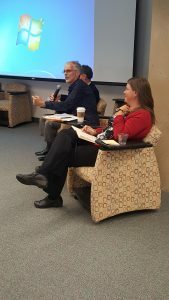 A Q&A session followed the hour discussion where a student asked whether “Big Brother” could be compared to the National Security Agency of today. “The commonality between all our panels was that it is corporations, not the government and we are choosing, and we are collaborating and embracing and participating in our own oppression,” stated Cherstin Lyon. Lyon gave an example in which she participates in her own privacy invasion. “It’s the personal choice. My husband brought home an Alexa, it goes off all the time and I keep thinking, that is so weird that I am voluntarily in a home where that is just sitting plugged in all the time,” said Lyon. 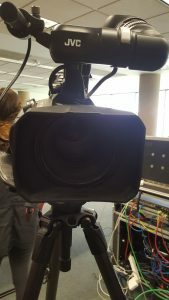 Metts refers to Marshall McLuhan who coined the term “the medium is the message” in the 1960s and references the change in human interaction as a result of television, phones and overall technology. “On the one hand, the technology is amazing because the research you can do, on the other hand, it’s a distraction… we are addicted to the technology, hopefully…we learn to put that on the side and engage in deep reading because it’s such a valuable part of an education. The technology is good but it’s also potentially dangerous,” stated Metts. 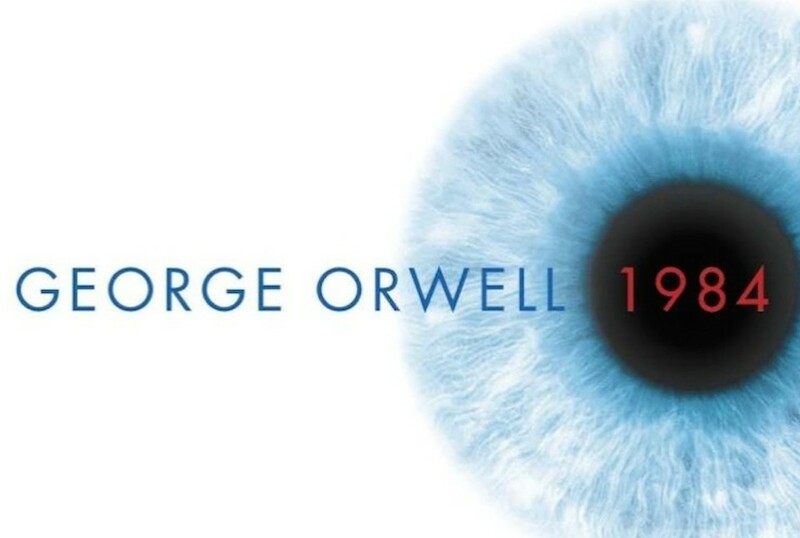 A topic that came in reference during the discussion was the use of Newspeak, a term used in the book that refers to their official language and how it relates to today. “From the brevity of a print medium like USA Today kind of newspaper that models itself after a visual medium, all the way to 140 characters like Twitter, it’s just reducing & reducing the complexity of thought…that’s potentially a dangerous thing,” stated Metts. One audience member posed a question about the power of boycotting products. “As a historian, marches and demonstrations are not particularly helpful in ending restrictive covenants and ending segregation but economic boycotts were very helpful. Thinking of the Montgomery boycott, a yearlong bus boycott by an entire community…the enormous burden on individuals to carry that out… successful but extremely difficult,” stated Lyon. One of the obstacles of boycotting Lyon referred to was the willingness of people to participate, and the extreme urgency that would be needed to move people to such extremes of political and social action. Metts mentioned the recent firing of Bill O’Reilly from Fox News was due to advertisers pulling funding, and not direct protests, which refers back to the corporate & financial influence on what is shown and changed. To conclude the hour discussion, Lyon closed with a takeaway message for the audience of the book. “It’s not staying alive so much as staying human. So in order to preserve our own humanity, we need to preserve our own thought and disconnect, unplug and take control over our time,” stated Lyon. According to Madrigal, the series was one of the most well-received Yotie Talks to date, and they’re delighted to have more stimulating conversations planned for May and June. Topics include causes and consequences of the underrepresentation of women in politics and two training days to support undocumented students. More information can be found by contacting [email protected] or (909) 537-5104. 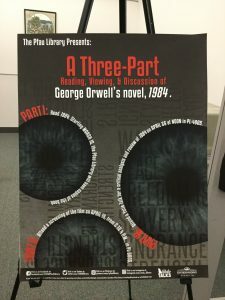 The second of the three-part series held in the Pfau Library. The Yotie Talk was filmed and will be available on youtube. 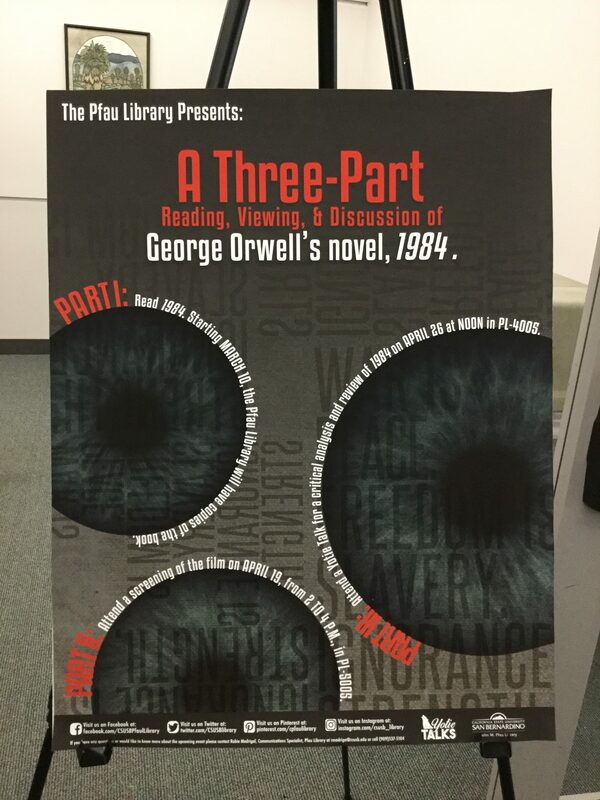 Copies of 1984 were available for students to check out since Spring Quarter to participate in the series.